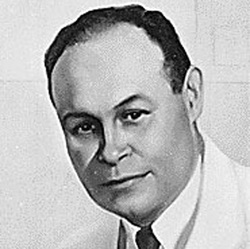 Dr. Charles Drew was born in Washington, D.C. in 1904. After completing his undergraduate education at Amherst College, he matriculated to McGill University for his medical training. He graduated 2nd in his class in 1933. He subsequently attended Columbia University for post-graduate training, becoming the first African American to receive a PhD in medical science. In his PhD dissertation, he described a novel technique for the long-term preservation of blood plasma. This paved the way for the modern concept of blood banks. His pioneering work saved the lives of countless civilians and allied service men during the Second World War. During World War II, Dr. Drew became the founding medical director of the Red Cross Blood Bank in New York City. He resigned his post in protest in 1941 after the United States War Department issued a directive separating the blood donations collected from white and black donors. 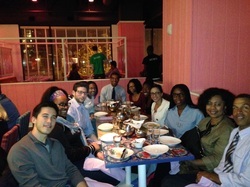 Dr. Drew instead returned to clinical medicine in order to serve as the head of the Department of Surgery at Howard University, later becoming Chief of Staff and Medical Director for Freedmen's Hospital. In the course of his career, Dr. Drew received numerous awards and honors, including becoming the first African American to be appointed an examiner by the American Board of Surgery. He died in 1950 in an automobile accident. Despite his untimely death at the age of 45, he is regarded as one of the most influential African Americans in medicine to date. In 1976, his portrait was unveiled at the Clinical Center of the NIH, making him the first African American represented in its Gallery of Scientists.